Biotinylated Human TACI, Fc Tag, Avi Tag (TAI-H82F6) is expressed from human 293 cells (HEK293). It contains AA Ser 2 - Thr 166 (Accession # O14836-1). The protein has a calculated MW of 46.8 kDa. The protein migrates as 33-40 kDa and 47-50 kDa under reducing (R) condition (SDS-PAGE) due to glycosylation. 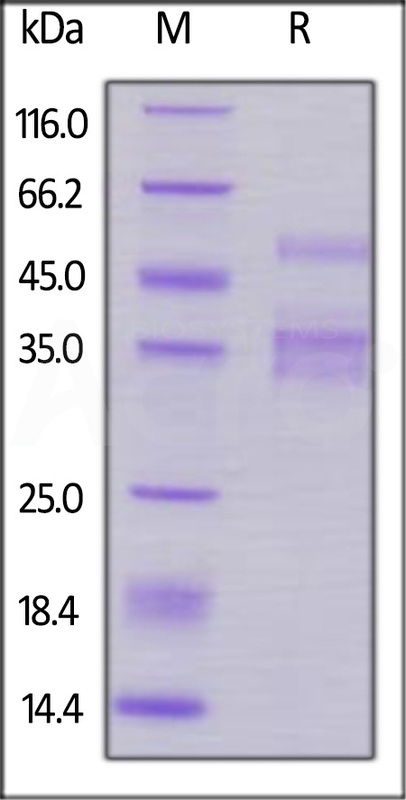 Biotinylated Human TACI, Fc Tag, Avi Tag on SDS-PAGE under reducing (R) condition. The gel was stained overnight with Coomassie Blue. The purity of the protein is greater than 90%. Immobilized Human BAFF, Fc Tag (Cat. No. 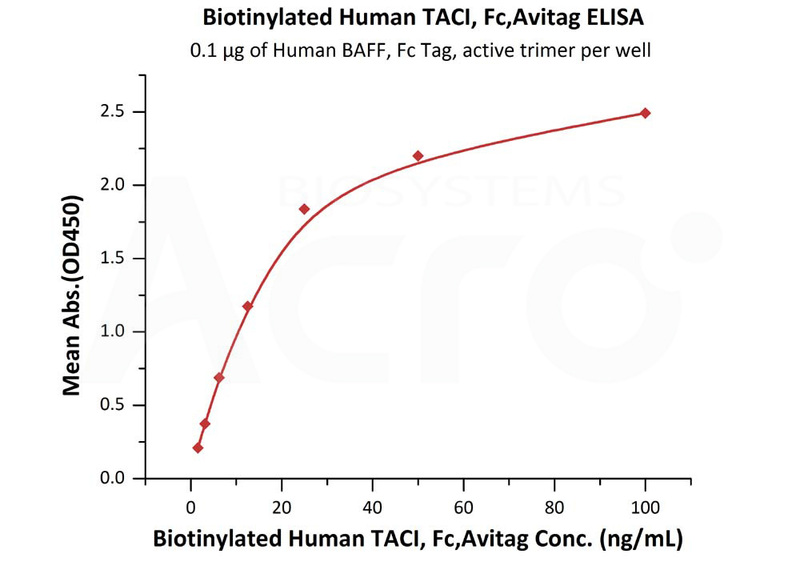 BAF-H4268) at 2 μg/mL (100 μL/well) can bind Biotinylated Human TACI, Fc Tag, Avi Tag (Cat. No. TAI-H82F6) with a linear range of 1.2-39 ng/ml (QC tested). Immobilized Human APRIL, Fc Tag (Cat. No. 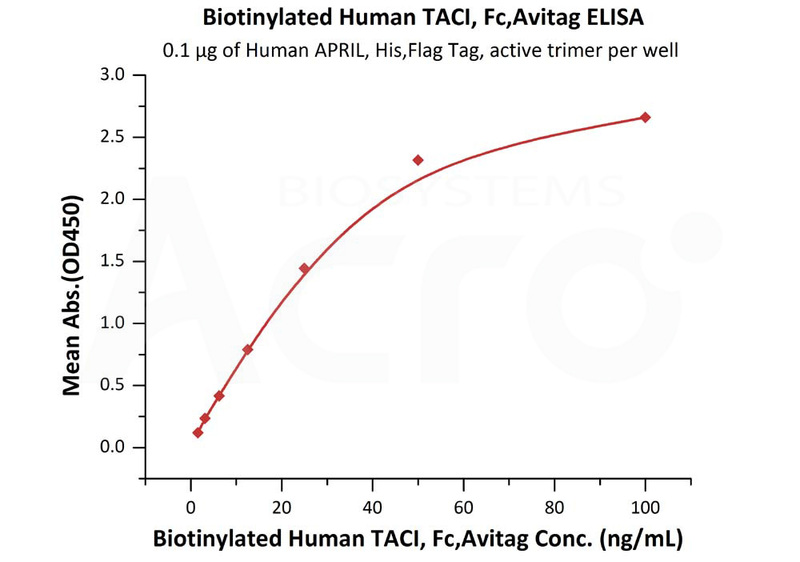 APL-H5267) at 5 μg/mL (100 μL/well) can bind Biotinylated Human TACI, Fc Tag, Avi Tag (Cat. No. TAI-H82F6) with a linear range of 0.01-0.313 μg/mL (Routinely tested). Transmembrane activator and CAML interactor (TACI), also known as tumor necrosis factor receptor superfamily member 13B (TNFRSF13B). It was originally discovered because of its ability to interact with calcium-modulator and cyclophilin ligand (CAML). TACI was later found to play a crucial role in humoral immunity by interacting with two members of the TNF family: BAFF and APRIL. The present study demonstrated that, in NSCLC, a proliferation-inducing ligand (APRIL), B-cell maturation antigen (BCMA)and transmembrane activator and CAML interactor (TACI) proteins are abnormally expressed by immunohistochemistry, reverse transcription-quantitative polymerase chain reaction and western blotting. In addition, the expression of APRIL, BCMA and TACI were observed to be involved in extracellular signal-regulated kinase (ERK)1/2 activation in A549 cells. (1) Dou, H., et al., 2016, Oncology Letters., 12(5), 3351–3355.